Fuel poverty affects a significant proportion of UK households and can cause or worsen many common physical and mental health problems. This article discusses the key medical consequences and how to minimise its overall burden. Fuel poverty affects a significant proportion of the UK population and is associated with deleterious effects on health. In this article, we discuss the epidemiology of fuel poverty, followed by a review of the key medical consequences and what may be done to minimise its overall burden. For the purposes of this journal, the discussion on health matters is confined to older adults; however, it must be appreciated that children are another vulnerable group who may be significantly affected. The fuel poverty status of a household depends on three interacting drivers: household income, energy efficiency and fuel prices.2 While there is a link with deprivation in general, it is not a linear one; most low-income households are not fuel poor, and conversely, an individual or family with a reasonable income living in an energy-inefficient dwelling may slip into fuel poverty. Furthermore and paradoxically, the UK and other countries with relatively mild winters such as Greece, Spain, Portugal and Ireland actually suffer more EWDs than countries with colder winters which have more fuel-efficient housing.6 A comprehensive review of fuel poverty conducted by Sir Michael Marmot and his team in collaboration with Friends of the Earth7 usefully divides the health consequences into circulatory diseases (responsible for about 40% of EWDs),8 respiratory disease (responsible for about a third),8 mental health and other, less direct health impacts, a blueprint this review follows. Whilst it is not reasonable for the medical profession to assume responsibility for a largely social problem,20 from a clinical perspective, it is worth bearing it in mind as a potential ‘red flag’ in cases such as frequent exacerbations of asthma or COPD, especially if patients feel more unwell that objective markers of illness such as spirometry and peak flow would indicate. In practice, it is most likely to be community-based clinicians such as GPs, district nurses and community matrons who flag this up, and there are agencies which may help. In some parts of the country, GPs can become part of ‘warmth on prescription’ schemes through which they refer patients to public health and housing services that can deliver interventions. Such referral schemes can be provided by local authorities, public health and housing functions or third sector organisations.21 Core funding is required for these services and, since they are not a statutory duty, their number and scope has been reduced during the recent years of local authority austerity. Cold homes referral schemes can be co-ordinated alongside other public health initiatives. Citizens Advice has recently published a toolkit for use by both local authorities and health bodies to deliver a joined-up approach.23 Additionally, a referral system would only be useful if there are appropriate systems in place to deliver support. 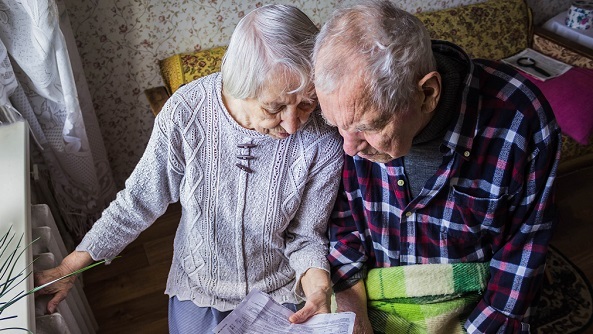 Over 65s can access the Warm Home Discount, the Winter Fuel Payment and the Cold Weather Payment.24 These payments may go some way to help address the ‘heat or eat’ dilemma. However, they are a year-on-year intervention that may prove more expensive in the long run than measures which improve the long-term fuel efficiency of homes. Energy supply companies have an energy company obligation ‘ECO’ to invest some of their revenues in improving home energy performance. This funding has for many years supported large scale programmes of boiler replacement and cavity wall insulation for elderly people. Since 2017 changes to the ECO programme require that the majority of funding be directed only to those households that meet the government’s strict definition of fuel poverty.25 Whilst this is intuitively fair, it does not capture all vulnerable households. For example, elderly pensioners living in their own homes may be asset-rich, whilst still cash flow-poor. Local Authorities have powers to deem households in their area as warranting support based on locally determined criteria, which could comprise health criteria.26 This has the potential to be coordinated with local referral schemes, and then a relatively limited national budget for ECO funding can be merged with other housing programmes designed to improve housing quality. Since no single organisation is ultimately responsible for addressing the challenge of ill health associated with cold homes, success will be reliant on the robust partnership between multiple organisations, including local health services. For individual cases, there are several potentially helpful agencies to which concerned clinicians can signpost patients. A vital part of the long-term solution, however, will be proactively ensuring that existing homes are made more fuel-efficient, and this should be an essential priority for future construction. 1. Boardman B. Fuel Poverty: from cold homes to affordable warmth. London: Bellhaven Press, 1991. 2. Department for Business, Energy & Industrial Strategy. Annual Fuel Poverty Statistics Report, 2018 (2016 Data). https://assets.publishing.service.gov.uk/government/uploads/system/uploads/attachment_data/file/719106/Fuel_Poverty_Statistics_Report_2018.pdf (accessed 30th January 2019). 5. Office for National Statistics. Death rates plunge despite coldest winter in 14 years. 16. Green G, Gilbertson J. Warm front: better health: Health impact evaluation of the Warm Front Scheme. 24. Heating and Housing Benefits, Gov.UK, 2018. https://www.gov.uk/browse/benefits/heating (accessed 7th March 2019).